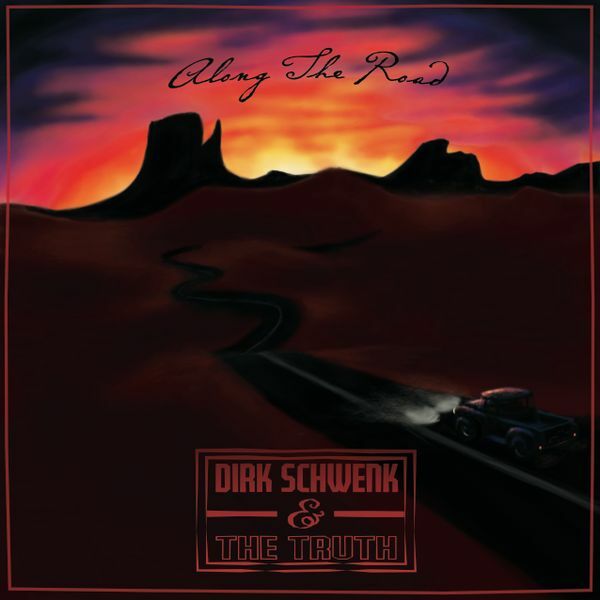 The cover of Dirk Schwenk’s Along The Road depicts a single pickup truck driving down a solitary stretch desert road at sunset. The sun is burning out over the mountains in the distance, turning the sky a mixture of pink and orange. It’s a pretty sight, but once the listener clicks play on Along The Road, they’re soon going to realize how perfectly that image captures the experience of listening to the album. Opening track “Table Set For Two” sets the mood for the rest of the record, depicting a slowly-mounting tale of infidelity. The narrative songwriting is powerful, walking the listener through the discovery, but stopping just short of Mark Kozelek before erupting into a soulful Eagles-esque guitar solo. Follow-up track “The River” is a picturesque flash of natural beauty, featuring a twangy banjo, delicate female vocals, and lush earthy imagery. It’s the musical equivalent of a vacation; kicking back at a warm, relaxing spot that seems to be made just for you. From there, the album’s back-half hits the listener with a trio of affectionate and earnest songs that range from groovy love ballads to patriotic celebration. While Along the Road is only comprised of five tracks stretched across 20 minutes, the release is short, sweet, and leaves the listener wanting more, which is always a good position to be in. Overall, the album is a fun country outing with the transportive ability to carry the listener to that beautiful desert at sunset, even if it’s just for 20 minutes.